Nicholas B. Davies FRS is Professor of Behavioural Ecology in the Department of Zoology at the University of Cambridge and a Fellow of Pembroke College. John R. Krebs FRS is Principal of Jesus College and Professor in the Department of Zoology at the University of Oxford, and a member of the House of Lords. Stuart West is Professor of Evolutionary Biology in the Department of Zoology at the University of Oxford. 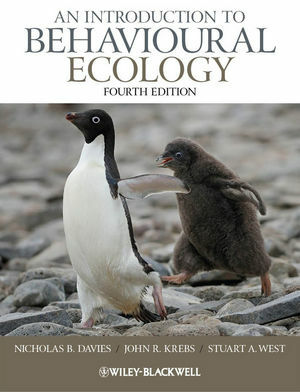 “[An Introduction to Behavioural Ecology, 4th Edition] Stands tall as the textbook to have in the field of Behavioral Ecology...I expect anyone with an A level in Biology, or equivalent, or an interest in Zoology without the qualification, could pick this book up and get a lot out of it...What this book is, is good science explained well, I scored higher in my behavioral ecology exam than I did in any other exam in my finals. I wouldn’t put that entirely down to this book, but it certainly influenced things. Visit this site for downloadable figures from the book.